The power of attorney for health care is similar to the financial power of attorney, except that it applies to health care decisions instead of financial ones. You can assign another person to make medical treatment decisions for you if you become medically unable to make decisions yourself. In New Hampshire, this can include withdrawing or consenting to almost any treatment or procedure to test, diagnose, or affect a mental or physical condition, and you can authorize your agent to withdraw or continue life-sustaining procedures. You can specify that you do not wish to receive life-sustaining treatment like mechanical breathing or artificial nourishment if you suffer from a terminal, irreversible condition or permanent unconsciousness. 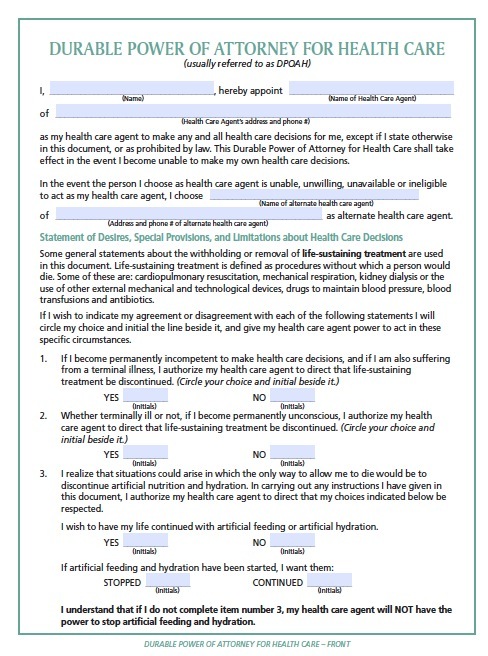 New Hampshire recently revised its power of attorney law to clarify the do-not-resuscitate order and enable the agent to apply these orders for the principal. These orders tell medical personnel not to perform cardiopulmonary resuscitation if the principal goes into cardiac arrest or stops breathing.